Cooking with your child is a great way to teach about food and nutrition, math skills and science. Mixing, chopping, pouring and decorating are all opportunities for children to work on arm and hand strength as well as fine motor dexterity. Visual perceptual skills are used when searching for ingredients on a spice rack or in the refrigerator. Emerging readers can look for sight words on recipes or product labels. Cognitive skills such as sequencing a multi-step task, prioritizing tasks and managing materials are inherent in cooking activities. And perhaps most importantly, cooking together provides you the opportunity for quality time as a family. Is your child reluctant to try new foods? Don’t worry; part of typical child development for children ages 2-6 is to avoid trying new foods. Talk with your pediatrician if you are concerned that your child’s picky eating is impacting their growth. Your OT may be able to help you assess your child’s food preferences and identify trends in texture, color, temperature or flavor, and suggest new foods to introduce. With that said, picky eaters should still be invited into the kitchen. Just being near a food provides visual input, introduces the child to the smell, how a food breaks up: Does it crunch? Does it mush? and more. Participating in any part of meal preparation is a step towards accepting new foods. Here are some kitchen activities for different age groups. Keep in mind these are general activities; some children may be ready for “older” skills and others may need to master “younger” skills before moving on. 2 year olds are developing control over arm movements and using two hands together. Invite them to participate in scrubbing fruit, wiping tables or counters, tearing bread or lettuce, dipping vegetables and pouring pre-measured dry ingredients into a bowl. 3 year olds are developing improved hand control and can start pouring small amounts of liquids, mixing soft batter, kneading dough, shaking pancake mix, learning to spread (it will be messy! ), placing raisins or other toppings and sorting ingredients by color. 4 year olds are gaining hand and finger strength. Your child can help by peeling an orange after it is started, squeezing fruit, mashing soft fruits or vegetables, unwrapping packages, pressing cookie cutters into dough or bread, helping to count and measure, helping to gather ingredients and pressing number buttons to set a timer. 5 year olds are developing more mature finger dexterity and cognitive skills. Have your child assist with measuring ingredients, grating long carrots or large pieces of cheese (with close supervision), using an egg beater, cutting soft ingredients with a dull knife and decorating with icing or other ingredients. Older children can practice math skills by doubling a recipe, figuring out how many servings a recipe will yield, and cutting a tray of brownies or bars into a given number of portions, etc. They can take ownership of a meal by planning and choosing recipes. Children always need supervision in the kitchen. 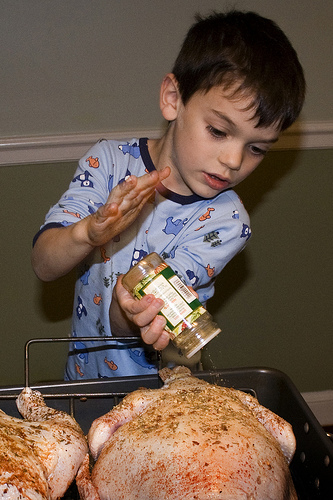 Teach your child to wash his hands before cooking or eating and after touching raw eggs or meat. Expect the task to take longer than usual. Don’t forget to have your child help with clean up. For more articles like this, visit Penn State’s Better Kid Care website.